Spironolactone is a potassium sparing diuretic used in the treatment of congestive heart failure (CHF), edema and high blood pressure (hypertension). Spironolactone is also used to treat potassium deficiency and hyperaldosteronism. Spironolactone requires a prescription from your veterinarian. Spironolactone inhibits the effect of aldosterone, a hormone that causes the tubules of the kidneys to retain sodium and water. This increases the excretion of water and sodium, while decreasing the excretion of potassium. Tell your veterinarian if your pet has kidney or liver disease, diabetes mellitus, high levels of potassium in the blood, or if your pet is being given a potassium supplement or an ACE inhibitor such as enalapril or lisinopril. Tell your veterinarian if your pet is pregnant or lactating. Spironolactone will cause your pet to urinate often, and your pet may have "accidents" and need to go outside or use the litter box. Make sure that your pet eats and drinks well while taking spironolactone or the risk of side effects increases. Spironolactone is a potassium-sparing diuretic (water pill). Spironolactone is used to reduce the amount of fluid in the body without also causing a loss of potassium. 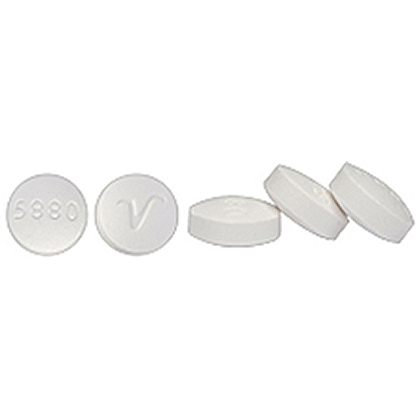 Spironolactone is used in the treatment of CHF, edema and high blood pressure (hypertension). Spironolactone is also used to treat potassium deficiency and hyperaldosteronism. Spironolactone may also be used for purposes other than those listed in this guide. Tell your veterinarian if your pet has kidney or liver disease, diabetes mellitus, high levels of potassium in the blood, or if the pet is being given a potassium supplement or an ACE inhibitor such as enalapril or lisinopril. Tell your veterinarian if your pet is pregnant or lactating. Spironolactone is a prescription medication that is not FDA approved for use in animals; however, it is a commonly accepted practice for veterinarians to use spironolactone in dogs and cats. 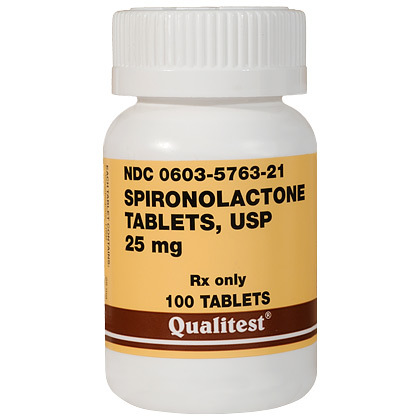 Spironolactone is available as 25mg scored tablets. The usual dose in dogs and cats is 0.5-1mg per pound every 12 hours. Give spironolactone with food to lessen stomach upset. Give this medication exactly as directed by your veterinarian. If you do not understand the directions ask the pharmacist or veterinarian to explain them to you. Spironolactone should be taken with food to lessen stomach upset. Keep plenty of water available for your pet. Do not suddenly stop giving this medication. Stopping suddenly could make the condition worse. Store spironolactone at room temperature, away from moisture and heat. Keep this medication away from children and pets. Do not use supplements containing potassium as these could cause high levels of potassium in the body. If any of the following serious side effects occur, stop giving spironolactone and seek emergency veterinary medical attention; an allergic reaction (difficulty breathing; swelling of the lips; tongue or face; hives); an irregular heartbeat, shortness of breath, fatigue, confusion, weakness, numbness, or decreased urination. Other less serious side effects may occur. Continue giving spironolactone and talk to your veterinarian if your pet experiences headache, dizziness, nausea, diarrhea, decreased appetite, or dry mouth. Other side effects may also occur. Talk to your veterinarian about any side effect that seems unusual or bothersome to your pet. Tell your veterinarian if your pet is being given probenecid, a nonsteroidal anti-inflammatory (NSAID) such as etodolac, carprofen or piroxicam or a diabetes medication such as glipizide. You should also tell your veterinarian if your pet is taking any other medication to treat high blood pressure, edema, heart problems, or some other condition. Drugs other than those listed here may also interact with spironolactone. Talk to your veterinarian before giving your pet any prescription or over the counter medicines. Spironolactone is a water pill (potassium-sparing diuretic) available by prescription that is used to treat edema, high blood pressure, potassium deficiency, and hyperaldosteronism. Spironolactone is not FDA approved for use in veterinary medicine; however, it is a commonly accepted practice for veterinarians to prescribe this medication for dogs and cats. Spironolactone is used to reduce the amount of fluid in the body without also causing loss of potassium. Give Spironolactone with food to lessen stomach upset. Keep plenty of water available for your pet. Other Ingredients: Calcium Sulfate, Hydroxypropyl Methylcellulose, Magnesium Stearate, Polyethylene Glycol, Polysorbate 80, Povidone, Starch (corn), Titanium Dioxide, and Flavoring.